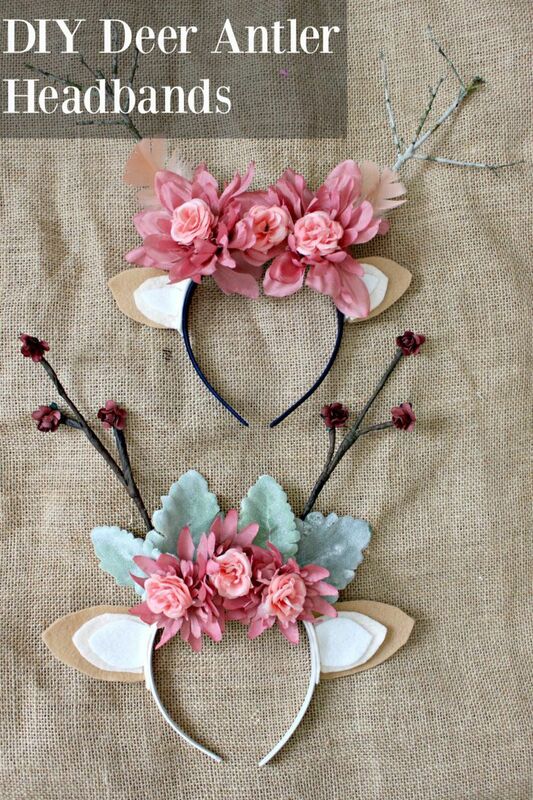 Headbands are all the rage so why not learn how to make deer antlers headband that look real. They’re not only really cute, regardless of age, but also make the perfect accessory for any costume, play or other occasion that will make the perfect statement. Here are some of our favorite deer antler instructions but remember that there are many other options. All it take is a little creativity and some patience. Brown lunch sack cut into strips. Paint (black, brown and grey). Faux fur in light and dark brown. Take a pipe cleaner and secure it to the headband by wrapping it around the band then twisting the end to secure. Place a dot of glue between the pipe cleaner and band to secure. Beginning at the base, wind another wire up toward the top then branch if off after going a little way up, branch off the main stem and trim the excess. Continue working up the main pipe cleaner the same way until you have at least 3 branches off the main pipe cleaner. Do the other antler the same way but make sure it’s an equal distance from the first before securing. Pour a small amount of Modge Podge into a bowl (or make your own) and mix it with an equal part of water. You want it to be thinner than it usually comes. Dip a strip of paper into the glue and wrap it around the pipe cleaner beginning at the bottom. Continue working the same way all the way up until you’ve covered the main stem and branches on each antler. Either leave the antlers to dry overnight or use a blow dryer to speed up the process. Once dry, paint the antlers beginning with the brown paint then adding streaks of black and gray. Be sure and blend where they meet. Be sure and put the lightest colors on the tips of each branch. Cut out 4 large ear shapes in the dark fur and small ear shapes in the light colored fur. Use the hot glue gun to secure the small ear shapes in the center of 2 of the large ear shapes. Bend the wire to match the shape of the large ears leaving 2″ extra extending from the bottom of each side. This wire will be used to secure the ears to the headband. Glue the large ears with the inserts to the wire with the hot glue gun. Glue the other large ear pieces of the fur to the back of the first. 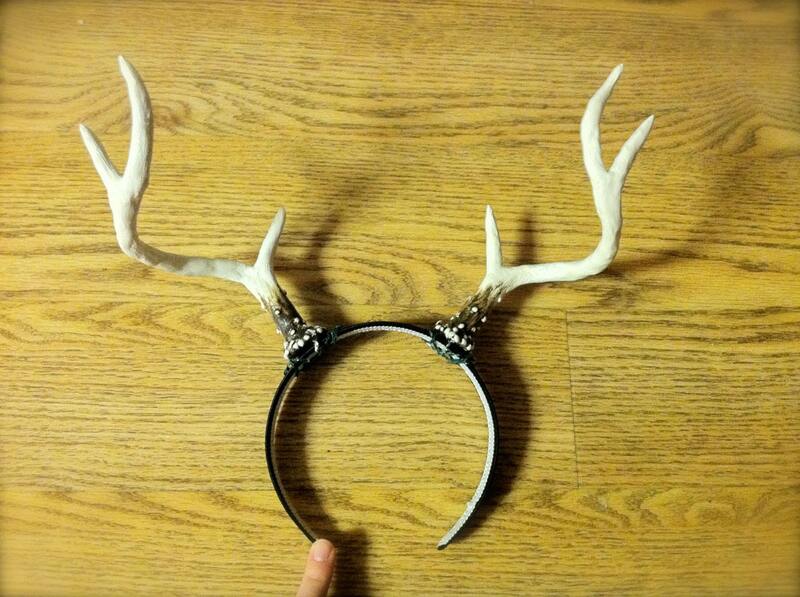 Once dry, use the extra wire to secure the ears to the headband just below the antlers on each side. Place a dot of glue between the wire and headband to secure them in place. Paper clay (aka air dry clay for example, Creative Paperclay). Acrylic paints (white, burnt umber and yellow). Select suitable dry branches that are smaller than the finished product you want. Cut them into small sections and arrange into 2 antler shapes. They should curve slightly just as real antlers do. Cut the tips of each branch and the top into points. Glue the joints in place then connect each joint with wire then masking tape. Use the pliers to make sure the wire has been twisted tight. Wrap wire around each base leaving a loop at the bottom. Do not wire the antlers together. Put on your apron then cover the surface of each antler with clay eliminating seams and flaws by squirting with water and rubbing them smooth. Hang the antlers from a pot rack or other system from the loop made earlier. It will take between 24 and 36 hours to dry completely. Put on gloves and apron and sand the dried antlers smooth. Remember that antlers are not perfect so it’s okay to have lumps and bumps. The tips should be sanded into a round rather than sharply pointed shape. The bottom of antlers are textured. To create that look just run lines of glue then add a few bumps up toward the top all the way around. Do not run beads to the very top as they should remain smooth. If needed, after the glue has dried then run a second strip on top of some of the first strips especially at the bottom. Let the antlers cool then cover them with primer paint. Use a palette knife to create quite a bit of bone colored paint on your palatte by mixing all the colors of paint you’ve collected. Remember that it will dry a little darker than what you see. Cover both antlers in the bone color then hang them up to dry. To prevent your paint from drying between uses just spray it with a little water and cover it with a plastic bowl. Antlers are darker at the bottom than they are on top. To create the look paint the entire base with umber up to about the midpoint. Apply streaks of bone on the glue ridges and bumps then blend with a dry brush. You want a streaky finish so don’t blend too much. Also, it should become lighter as you work your way up so keep that in mind as well. Hang them up to dry then spray them with varnish and allow to dry again. Attach them to your headband with wire making sure the curve faces forward just like real antlers. Note: Make the ears the same way as in project 1 only use felt instead of fur. Attach them with wire just below the antlers. Hot glue gun with rods. White glue (like Elmer’s Glue). Cut wire into sections of 2 each 15″, 7″ and 4″. Twist the 7″ wire around the center of the 15″ wire just above the halfway point and tape it so it doesn’t slide. Twist the 4″ piece below it and tape it in place. Repeat the process using the other wires for the 2nd antler then bend them into the desired shape. Beginning 2″ up from the bottom, mold aluminum foil over the wires to give them shape and dimension. Wrap each antler completely in masking tape with the exception of the bottom 2″. Next, wrap the wires left over at the bottom of the antlers around the headband and secure them before gluing in place. Finally, wrap masking tape around the wires. In a bowl mix 2 parts of white glue to 1 part of water until thoroughly mixed. Tear the newspaper into 2″ strips and, one at a time, dip them into the mixture, wipe off the excess between 2 fingers then wrap the strips over the tape-covered antlers. Overlap the strips as you work and make sure that all tape is covered. The bottom should be covered so it’s thicker than the top. Cover the extra mixture with plastic wrap and set the antlers aside so they can dry overnight. Apply a 2nd layer of paper mache shaping it as you go then allow it to dry overnight. Spray a base coat of bone colored paint. Spray a few strips of darker paint from the bottom to midway up being sure not to completely cover all the bone color but just to add a little darkness to the bottom. The dark will fade as you spray up by moving it farther away from the antlers. Cut the wire and shape it into an antler shape. You should have the main branch then arms that branch off as you work your way toward the top. Use masking tape to cover the wire and secure the arms in place. Be sure and leave 2″ of wire uncovered at the bottom with which to secure the antlers to the headband. Beginning where your tape is, run a bead of glue then wrap the yarn around the masking tape working your way out each branch and up toward the top. 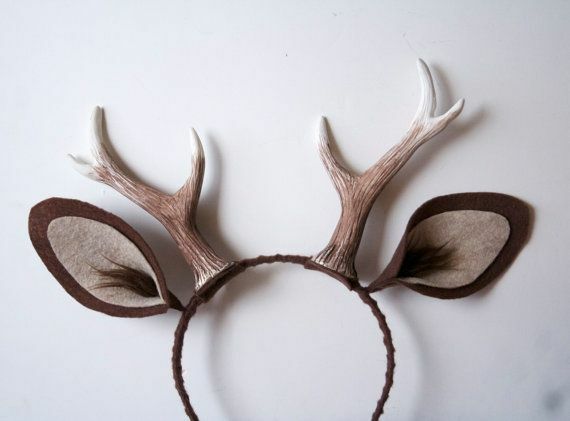 Use the remaining wire to attach the antlers to your headband and glue then tape them in place. Using the same process as described in Step 3, attach yarn to the headband beginning at one end and continuing until you get to the other side being sure to cover the wire where the antlers are attached. If desired, glue the flowers in front in the center. 2 twigs of similar shapes and sizes. Felt (tan, cream and white). Wrap the twigs in floral tape. Cut 2 strips of brown felt ½” wide and wrap it around the base of each antler gluing it in place as you go. Cut a strip of felt the width of the headband and as long as you want the distance between the antlers and glue the antlers to each end of the strip. Glue the strip with the antlers to the headband. Cut 4 large ears out of the tan felt. Cut 2 medium size ears out of the cream felt. And cut 2 small ears out of the white felt. Shape the wire to match the large ears then cut off the excess. Glue the wire to the back of the ears then glue the second set of large ears to the back. Glue the medium size ears to the center front of the large ears then glue the small ears on top of the medium. Cut a strip of tan felt the width of the headband and as long as the ears are wide. Glue the ears to the strips then glue each set of ears onto the headband below each antler. Glue the greenery to the front of the headband then the flowers on top of the greenery. For a special touch, glue mini-flowers or babies breath to the ends of each branch of the antlers. 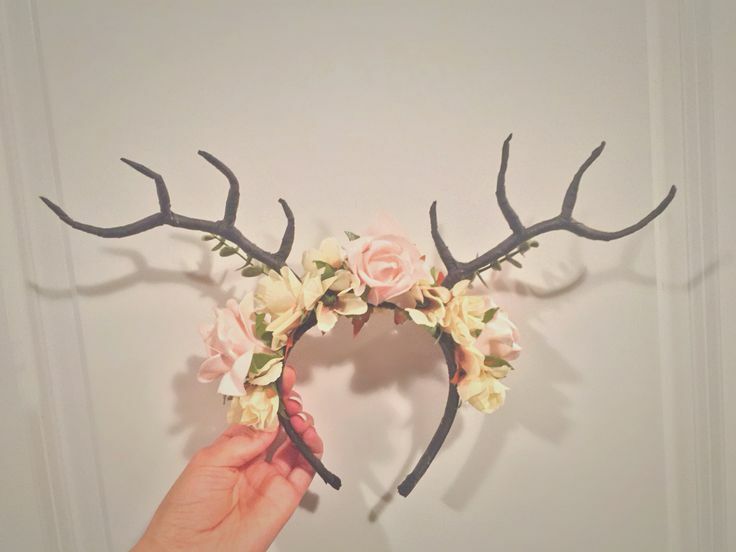 Whether you need antlers for a party, play, costume or just because you’d love to have a pair they’re relatively easy to make. Best of all, when it comes to how to make deer antler headbands there are no limitations. They’re whimsical, sweet and perfect for just about any occasion.